I usually leave my hair to its own devices, but today I decided to dust off my lovely styler! 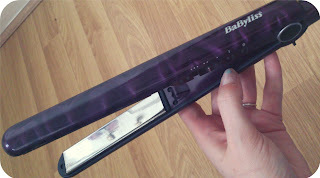 I use the 'Babyliss Pro 230 Elegance Metallic Purple Straightener'! I have had it for about 3 years now and it has never failed me and is still going strong. I use it to straighten, wave and curl my hair and it always leaves a silky smooth, long lasting finish. The iron is a lovely Metallic purple colour with a wave through detail - very stylish ;) It Features beautiful titanium, mirror reflective ceramic plates which are 25% longer than other irons - perfect for long hair like mine, the smoothness of the plates is what will give your style its sleek finish! This little treasure also features 3 heat settings, so it is safe for all hair types, and incredibly, it can heat to 230' in just 15 seconds - a life saver for if you are in a hurry but just need a quick touch up! Unlike many irons this model has a swivel cord which is 3 meters long - just right for people who don't have plug sockets near enough to their bedroom mirrors - Babyliss seem to have thought of everything! Another genius feature of this model is that it has an 'auto shut-off', which is brilliant for people like me who can be a little bit forgetful - especially when quickly styling before running out the front door! I started off by spraying some 'Loreal studio Matt&Messy salt spray' through my hair and then scrunching it up in my palms towards my roots. This spray is amazing, It smells lovely and keeps my hair exactly as I want it all day, even when battling against the wonderful British wind! 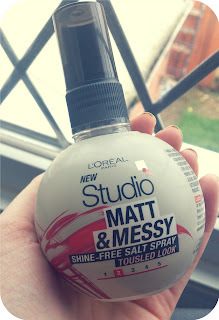 Because I had already styled my hair, the spray didn't have much of an impact (I was only using it for the staying power), but when I use this spray on my natural straight hair, it gives a wonderful wavy, 'beachy' look, which I fall in love with every time and cant wait to show off in the summer! I then finished off with some of my go-to hair product. Tresemme freeze hold hair spray in #5 - ultimate hold! This Spray is a little on the expensive side for me, but I always buy it as it lasts forever, and trust me, because it is 'freeze hold' a little goes a loong way - unless you want to end up with a big crispy beehive on your head! It has the typical 'Tresemme' scent, which is pleasant and not too overwhelming, considering it is a hairspray! I sprayed sparingly onto my hair from a distance and shook my hair through with my fingertips, leaving it tangle free and beautifully glossy! What is your favourite Hair product & what do you recommend that I try next?